Next to a marinara, this is about as simple a sauce as one can make. With tuna as its protein, this sauce is not as strongly flavored as, say, a puttanesca. As a result, one needs to be careful not to overpower the tuna with a lot of strong herbs and spices. The recipe, as presented, is exactly as my family made on many a Friday, with the exception of the capers and mushrooms. I happen to love both with my pasta. As for you, if it isn’t a tomato sauce unless you taste oregano or some other herb, spice, or ingredient, then by all means add it. Just be careful not to overwhelm the tuna and, please, just say no to cheese. Add oil to a medium sauce pan and heat over a medium-high heat. Add onion, garlic, and parsley and sauté until onions are translucent, about 5 minutes. If using mushrooms, add them now and continue sautéing another 3 or 4 minutes. Add tomato paste and sauté for about 2 more minutes. Add tomatoes, stir to thoroughly combine, bring to boil, and reduce to a simmer. Bring a large pot of salted water to boil. After 30 minutes, carefully add tuna so that the chunks do not fall apart. Add pasta of your choice into the boiling water. When the pasta is cooked al dente, remove from heat and drain. Add 2 tbsp basil (and capers, if used) to the sauce and stir carefully. Combine cooked, drained pasta with the sauce, stir until well-coated, garnish with remaining basil, and serve immediately. This is another quick sauce. If you cook it for too long after the tuna has been added, the chunks of tuna will disintegrate. This entry was posted in Family Recipes, Pasta/Rice/Soups (Primi Piatti), Sauce/Gravy (Ragù/Sugo), Seafood (Frutti di Mare), Vegetarian and tagged Cooking, Food, Italian, Pasta, Recipes, Seafood, Tomato Sauce by ChgoJohn. Bookmark the permalink. AND it’s Double Filet-O-Fish season as well! Fresh, too! Really nice dish! 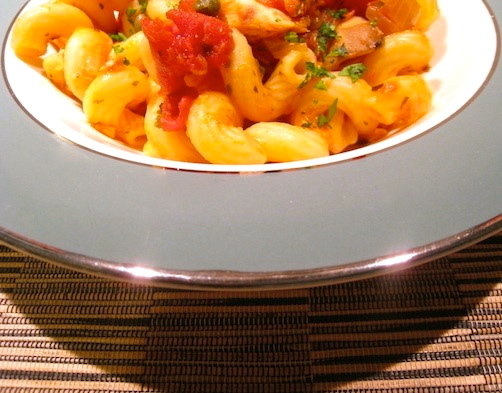 I’ve had tuna in pasta sauce, but never made it – I really should. I’ve basically given up on water-packed tuna — too often I find it has little flavor, and the tuna is kinda mushy. It’s olive oil for me now most of the time (OK, I still do buy some water-packed, but not when I really want texture from the tuna). Good stuff — thanks. Thank you, John. Tuna in a tomato sauce was pretty much a Friday night staple, along with some sort of fish. Looking back, I’m amazed at the variety of seafood that made its way to our table on Fridays. Going “vegetarian”, in today’s sense, wasn’t even considered. Like you, I use water-packed tuna less and less. “Washed out” comes to mind. Strange, I almost made my – even quicker (with fresh tomatoes – we still have beautiful tasty tomatoes here) version of this last night, but opted for chunks of mozzarella in place of the tuna (as I had one, and not the other!). The capers and mushrooms would have been a delicious addition!